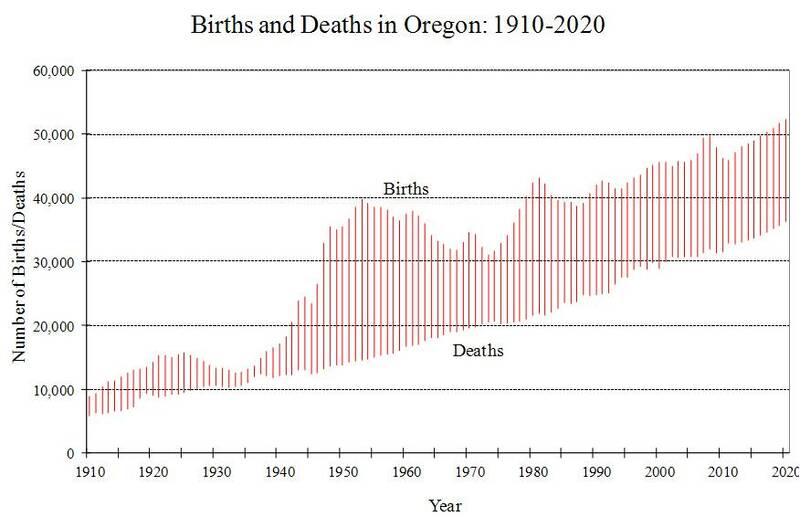 This post summarizes a great resource document Kanhaiya, the state demographer, has posted on our main website regarding Oregon’s demographic trends through 2011 (plus forecasts). Click here to download the full file. Oregon’s population was 3,831,074 on April 1, 2010 and is expected to reach 4.3 million by 2020. From 1950 to 2010, Oregon population increased 152% while the U.S. overall only increased 104%. Population growth from 2000 to 2010 was 12%, ranking 18th fastest among the states, however this was a deceleration from the 20.4% growth from 1990 to 2000, which ranked 11th fastest. Oregon’s population slowed considerably in recent years due to the recession. Overall economic activity and migration are closely related. As the economy recovers (job growth, housing market improvement), Oregon’s population growth is expected to be stronger than the U.S. rate. The graph below illustrates Oregon and the nation’s population growth rates. During the 1990s and mid-2000s, net migration accounted for nearly 3/4 of Oregon’s total population growth. Currently, net migration is only accounting for 32 percent of total growth. Net migration is forecasted to contribute approximately 2/3 of population growth over the coming decade. On the bright side, population growth continues to be positive this recession. 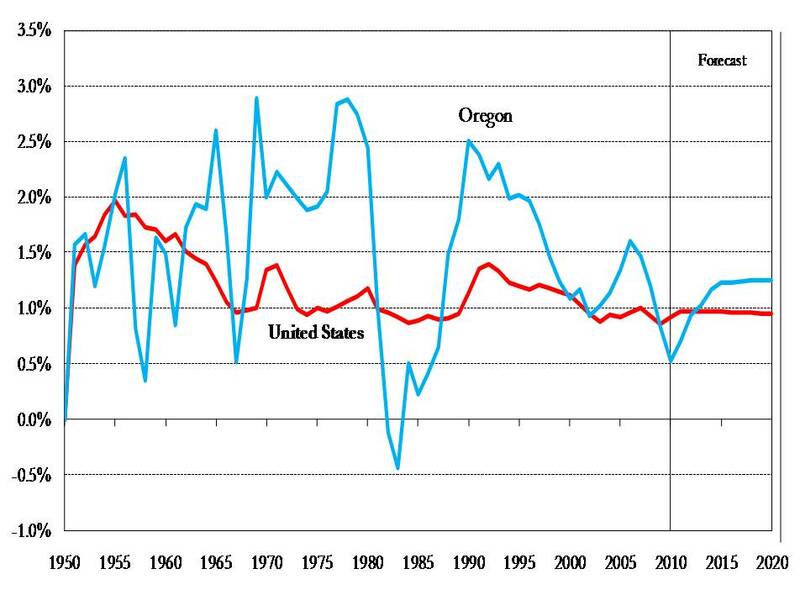 Net migration and overall population growth was negative during the early 1980s recession in Oregon. Currently about 46,000 children are born each year in Oregon. This will increase to nearly 53,000 by 2020 as the number of women in child-bearing ages increase. The Great Depression (small number of births) and Baby Boom (large number of births) cohorts are responsible for shaping Oregon’s retirement age population. Oregon’s life expectancy is slightly higher than the U.S. average. While women tend to live longer than men, the increases in life expectancy in recent decades has been growing quicker for men, thus reducing the gap somewhat. The graph below is one of the most interesting graphs I think our office produces. The differences between the Great Depression, when there was essentially no natural increase in the population, followed directly by the baby boomers provides an illustration of the age structure of our state and country – both present and into the future. In 2010, 21.5 percent of Oregonians belonged to a minority race or ethnic group, the U.S. figure is 36.3 percent. Hispanics or Latinos account for 11.7 percent of Oregon’s population compared to 16.3 percent in the U.S. Minority groups, as a whole, are growing faster in Oregon than the national average, thus accelerating the diversity of Oregon’s population. However, Oregon remains much less diverse than the U.S. overall. School-age population growing slower than total population due to declining fertility rate and slower growth in women in prime childbearing ages, characterized by the baby-bust generation. In 1980 children ages 5-17 accounted for 19.9 percent of total population. In 2000 that percent fell to 18.0 percent and currently it is 16.4 percent. This percent is forecasted to fall to 15.4 percent in 2020. The college-age population (18-24 year olds) grew quickly in the 1990s and early 2000s as the children of the baby boomers entered the group however growth has tapered off since then and the group is expected to decline in the near future. The 25-44 age group grew slowly or declined in the recent decade as the baby boomers exited the group, however now their children are beginning to enter the group. The 45-64 year old age group will experience very slow or negative growth in the near future as the baby boomers exit the group. Since 2003 the elderly population has been growing faster than the overall population; this trend is expected to continue in the coming decade. This age group’s growth will exceed 4 percent annually for nearly a decade and in 2020 there will be 48 percent more elderly than in 2010. For the full document in PDF format, click here.